"The Tale of the Bunny Picnic" is a wonderful children's classic video that is loved by all ages. 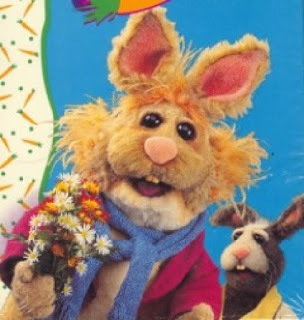 It is the perfect children's video for Easter, but will be treasured throughout the year. Jim Henson really out did himself when he created this story. The story and the characters are beloved childhood memories for both of our children. Actually, they still watch the video! The Tale of the Bunny Picnic is an interesting twist to the "boy who cried wolf" story and has bunny rabbits for the main characters. You'll love all of the bunnies, especially Bean. You will even love the farmers dog. This adorable little bunny adventure is sure to win your heart! 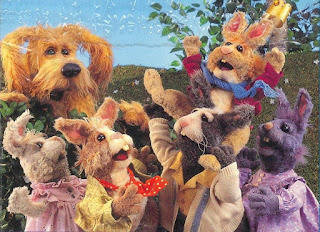 The animated bunnies, dogs, people and other animals in Jim Henson's video, The Bunny Picnic," are all really endearing. The story centers around Bean, a young, imaginative bunny who tells so many tales that when he really does discover that the farmer has a new dog to hunt rabbits, none of the other bunnies believe his warning. When my now grown children were little, this video played constantly. We memorized the songs and some of the lines. Even today, when one of us randomly starts reciting sections of the tale, the rest of us join in with the appropriate character responses. I truly believe when a story has that kind of lasting effect, that must be the best recommendation that can be given. Story Teller: "Fox, Fox, I'm the Giant Hedgehog and even though I'm really, really big and you're really, really small, I'm not gonna hurt you and do you know why?" Story Teller: "Because those who hurt others, hurt themselves." How to Purchase Your Copy of "The Tale of the Bunny Picnic"
Because these videos are no longer in production, they are not always easy to find. Plus, when you do find a copy, they are often quite expensive. I have honestly found the best place to search for the video is on Ebay. The video may be used, but it is still worth buying your own copy. Huh -- somehow I missed this cute video the first time around. It looks like something my two youngest grandsons would really enjoy. Thanks for your review and educating me on another wonderful video. Oh this looks like a wonderful video for me to share with my little grandchildren! How sweet! So cute. A good video for story time on a rainy day! I love it! Great review, I have not seen this before either.....it must have been hiding from me in plain view and I just needed you to bring it to the fore....thanks! Too cute! I've never seen this either. Some how I've missed this one, with two grown children and now four grandchildren!! It sure looks like my grandchildren are going to love it. Thanks for another great review. I had never seen this, since I was media deprived for about fifty years. I can see why children would be drawn in by the music and the characters.